Pivot Point Split Key Rings are made of high quality, nickel plated steel and designed to lay flat. Special wire drawn to a half circle shape is wound with the flat surfaces together. Construction is a full two turns with a “dog leg” jog where the ends meet. This design offers a smooth appearance and prevents the ends from “catching”. Used as key rings, cotters, and attachments for Steel Lanyards or Nylon Lanyards; these rings are strong and attractive. For a lower cost ring, check out our Basic Ring. Other rings and cotters available Circle Cotters, Kickout Rings, Bow-Tie Locking Cotters, Rue-Ring Locking Cotters and Hair Pin Cotters. 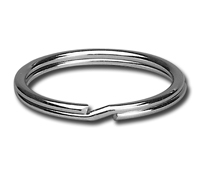 Pivot Point Split Key Rings are made of high quality, nickel plated steel and designed to lay flat. Special wire drawn to a half circle shape is wound with the flat surfaces together. Construction is a full two turns with a "dog leg" jog where the ends meet. This design offers a smooth appearance and prevents the ends from "catching". Used as key rings, cotters, and attachments for Steel Lanyards or Nylon Lanyards; these rings are strong and attractive. Also available from Pivot Point is a more Basic Ring, and other rings and cotters include Circle Cotters, Kickout Rings, Basic Rings, Bow-Tie Locking Cotters, Rue-Ring Locking Cotters and Hair Pin Cotters.